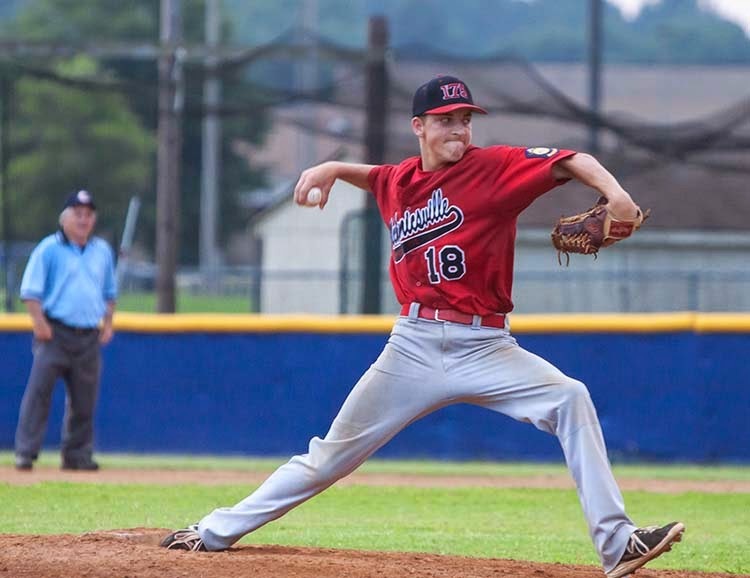 An early-game avalanche of slowly hit balls finding the right place, untimely errors, and a couple of key power hits completely knocked Mechanicsville Post 175 off its game Wednesday night. 30 minutes after the first pitch, they were down 9-0. Not a team accustomed to or built for comebacks, Post 175 fought but still fell well short, losing 13-5 in the American Legion District 11 Tournament Championship game. Mechanicsville finished 15-4, with three of those losses coming to Post 361. Starter Joey Pride yielded two runs in the first, then 361 struck for seven big runs in the second off Pride and Cody Powers. The kill shot was a grand slam home run just to the fair side of the right field foul pole by Patrick Hall (Glen Allen). Due to balls bouncing the wrong way and key errors, the three runs scored along with Hall on the shot were unearned. Suddenly, Post 175 had a huge hole for the second straight night. But with only an inning and a half in the books, there was plenty of time and opportunity for Mechanicsville. In the end, opportunity knocked several times, but was only answered once. The bases were loaded in the fifth, when 361's lead had increased to 12-0. Josh Lam struck out, then Trevor Denton launched a long home run over the left field fence, cutting the lead to 12-4. Lam would have, incredibly, two more chances to bat with the bases loaded. He struck out again, then hit a sacrifice fly to score Brady Didlake in the eighth for 175's final run. Mechanicsville stranded 13 runners. Another powerful season for the team that included their third straight District 11 regular season crown, ended with an uncharacteristic thud. Post 175 is built to strike quickly offensively, then allow their pitching depth to finish the work. Post 361 never let them play that game the past two nights at L.C. Bird, and once the lead reached between eight and twelve runs, that's simply asking a lot of any team. Both Tuesday and Wednesday night, Post 175 entered the ninth inning needing eight runs to force extra innings. Many of the players now will begin to focus on their work at various colleges next season, like Haiden Lamb at VCU, Roy Coates returning to Marymount, and Andrew Sergent to walk-on at West Virginia. They'll remember plenty of success from this season, but, for awhile, will remember more the two nights in Chester that simply got away. They could have wrapped up the American Legion District 11 title for the third straight year tonight. Instead, Mechanicsville Post 175, for the second straight year, must win it the hard way. Falling behind 9-1, then falling short in a ninth inning rally, Post 175 fell to West End Post 361 9-6 tonight at L.C. Bird High School in Chester, forcing a "winner-take-all" championship game in the double elimination tournament. 175 starter Patrick Holler matched 361 starter Patrick Hall inning for inning until the fifth, when Hall slammed a Holler pitch over the right field fence for a solo home run to give 361 a 1-0 lead. It fell apart for 175 in the sixth when Holler started the frame with back-to-back walks after a flyout. Holler finished with 5.1 IP, allowing three runs on three hits, striking out six, while walking three total. Kyle Battle greeted reliever Thomas Renfro with a double to left-center, scoring the two walked batters, Drew Barker and Will Black. Two singles, a fielders choice and an error later, five runs were across and it was 6-0. Post 361 added important insurance runs with two in the eighth, one in the ninth, putting 175 in a 9-1 hole with three outs to go. But Mechanicsville mounted a rally, chasing Hall after eight innings and four batters. After walks to Josh Shepherd and pinch hitter Cody Powers, pinch hitter Josh Lam doubled to center to score both men. Anthony Zona singled to left. Closer Kyle Saltzberg was greeted by Evan Swecker with a three-run homer to left center field to cut the lead to 9-6. Haiden Lamb doubled to left with two out, but Jakob Pridemore popped out to first to end the rally and the game. Post 175 is now 15-3, and has the benefit of a deep pitching pool for the title match. They can opt to start Powers, Joey Pride, or Taylor Crowe, who started 175's 6-2 win over 361 Friday in an earlier tournament round. Head Coach Bobby White says it is up to the players as to whether they want to take the title and advance to next week's American Legion State Tournament. "I told them to go home, look in the mirror tonight, and decide whether or not they want this season to continue," White said. "I said it's not often you get to play for a championship." Game time is 7pm at L.C. Bird High School in Chester. On June 30th, HCS Media Network reported here on the June 24th meeting of the Virginia High School League (VHSL) Alignment Committee, which met in Charlottesville to discuss changes to the new six-classification system due to normal student population changes at schools throughout Virginia. The meeting also served as an opportunity for all twelve regions to report to the committee on concerns voiced by individual schools, and in the case of one region, a collective of schools, about the new system implemented in the 2013-14 school year. Our original report focused on several issues, including the proposed changes that came out of the meeting, how they would affect several schools in our coverage area, and why the existence of "districts" continues with the proposal of districts for the 2015-16 and 2016-17 school years with one area change. HCS Media spoke with Atlee Activities Director Dave Kannewurf this week via email. Mr. Kannewurf serves on the VHSL Alignment Committee, and spoke candidly about the meeting, its purpose, rationale behind portions of the proposal, and confirming the continued existence of districts and why that is the case. Of note, Mr. Kannewurf did not attend the June 24th meeting (he represents the 5A South Region) due to being on vacation, but Atlee principal Jennifer Cohodas was there on his behalf. Kannewurf was in constant communication with Cohodas during the actual meeting. A QUESTION OF BALANCE: While exploring the changes in school enrollments, the committee was also charged, in trying to settle the new classification system into existence in preparation for its second two-year cycle, to reach a goal given to them by the VHSL. "The Alignment Committee was given the tasks of balancing out the Regions and Conferences," Kannewurf said. "The parameters given were that Conferences should have between five and eight members, and Regions should have 24 to 28 members." In the Richmond area alone, Conference 11 had eight members, Conference 12 had six, while Conference 16 had only four. Thus, where Patrick Henry only had to win one game in their conference tournaments to clinch a 5A North Region playoff berth, Atlee and Lee-Davis, in Conference 11, had to win two games. "The difference between 5A North and 5A South was such that a few schools from 5A South needed to move to 5A North," Kannewurf noted. The proposal would place 28 schools in 5A South, 24 in 5A North. The biggest change involves area schools, as Atlee, Mills Godwin and Deep Run would move from 5A South, Conference 11 to 5A North, Conference 16. "Mills Godwin, Deep Run, and Atlee were the most western and northern schools which made sense when looking at locations," Kannewurf explained. "They are also the closest schools to the current members of Conference 16, which consists of Albemarle, Orange, and Patrick Henry." Halifax County, also a current member of Conference 16, has been moved in the proposal to 5A South, Conference 12 to be the only non-Richmond/Petersburg area member of a seven-team conference. Kannewurf also noted Conference 11 had to shed members, because, after a request by Patrick Henry to move to Conference 11 to join its county brethren created a scenario where the conference would have nine members, outside of the given parameters. PLAYOFFS ONLY: On paper, this would give the impression that Eastern Hanover rivals Atlee and Lee-Davis will be separated, and this is true when it comes to the playoffs. Currently, Patrick Henry could not face either Atlee or Lee-Davis in the postseason until the State Semifinals due to the Patriots being in 5A North, the Raiders and Confederates in 5A South. But now is a good time to discuss a major point of the meeting, and the foreseeable future when it comes to how rivals, not just in Hanover, but across the state, are scheduled. "It is important to remember that this is for playoffs only," Kannewurf stated. "With district scheduling, Atlee will continue to play Lee-Davis twice a year in most sporting events. The effect of this change will not change anything as far as competition goes between them. A perfect example of how competition will look is to look at the competition between Atlee and Hanover both prior to the new system and after. As you could see from last year, Atlee and Hanover continued to play each other twice in most or all sports." THE DISTRICTS LIVE ON: The reason why an Atlee/Lee-Davis rivalry can continue is the VHSL continues to use the old "District System" from the former "Three-Group" classification system used from 1970-2013 to determine regular season schedules. Many people believed that the VHSL approved continued use of old district schedules in the first two-year cycle of the new classification system to help bridge schools from the "old" to the "new". That was never the plan. "Currently, there is no plan to move away from district scheduling," Kannewurf said. "Each district is reponsible for making that decision. Any change would have to be voted on by the principals of that district. When the new alignment was designed by the VHSL (in 2012), it was done for postseason purposes only and with the belief that regular season competition would still be district driven. What this system has done is that it has opened up the door to play your non-district games against conference schools." The one proposal coming from the make-up of districts for 2015-16 and 2016-17 would swap Patrick Henry and Glen Allen, the Patriots going to the Capital District, where they haven't resided since the 1970's, to join their county rivals, and the Jaguars moving to the Colonial District, where they would be in the same district as county geographic neighbors Hermitage, J.R. Tucker, and Deep Run among others. For Patrick Henry, this would finally give them the ability to change their football schedule. Since the opening of Hanover High School in 2003, the Patriots have used their three non-district slots in their September schedule to play Hanover, Atlee and Lee-Davis in the Tomato Bowl. The rest of the schedule was for Colonial District teams. With PH in the Capital, not only can they schedule new non-district opponents, they can also play county teams later in the season, not forced to face them all back-to-back-to-back in early to mid-September. NOT FOR ANOTHER YEAR: It is important be to reminded here that, once the proposed changes are approved, they will not take effect until the 2015-16 school year. The new year almost upon us will operate just like last year did. Schools are currently filing appeals to the proposal with the VHSL Alignment Committee. They will be heard at a meeting on August 11th. Once approved in either its current or an amended form, the Alignment Committee will present the proposal to the VHSL Executive Committee for possible approval on September 17th. THE CHANGES: Here are the new proposed Conferences by Region affecting all Metro Richmond area schools. Teams that have moved will be in bold with former home in parentheses. Any moves from one classification to another (example: 3A to 4A) is due to rise in student population. There are a few that move down, not always due to falling student population, but more because enough schools with rising populations moving up have pushed some schools down one classification. Conference 33: John Marshall moves down one classification, joins Maggie Walker Governor's School, King William, Washington & Lee, Arcadia, Bruton & Nandua. Windsor leaves, moving to 1A East. Conference 34, containing Goochland, Amelia County, remains the same. Conference 42, containing Chesterfield Community, West Point, and Charles City remains the same. OF NOTE: 4A teams will be interested to know that Tidewater schools Phoebus, I.C. Norcom, Booker T. Washington, Tabb, and Lakeland all move down to 3A East. Phoebus is a long time football power, while Glen Allen boys basketball defeated Booker T. Washington in February to clinch a 4A State Tournament berth. The battle for the District 11 Title and a berth in the Virginia State American Legion Tournament begins on Thursday night in a double-elimination format. NOTE: The District 11 Tournament Champion begins play in the State Tournament on Monday, July 28th in Purcellville, Virginia. 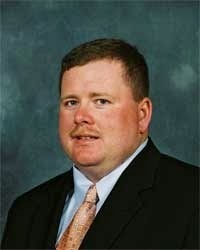 Ryan Turnage has been named the new head football coach at Lee-Davis High School. The move was made at Tuesday night's Hanover County School Board meeting and confirmed to HCS Media Network via our partners at the Hanover Herald-Progress. Turnage last served as a head coach at Jamestown High School in Williamsburg from 2007 to 2011, compiling a record of 26-25 and guiding the Eagles to their first-ever playoff appearance in his final season. Jamestown also made the 2013 playoffs in the new 4A classification, losing to eventual state champion Dinwiddie. Turnage has spent the past two seasons as an assistant coach at Woodside High School in Newport News. The new coach has Hanover ties, as he spent two seasons on Pedro Arruza's staff at Randolph-Macon during the 2005 and 2006 seasons. Turnage is married and has a six year-old son. The Lee-Davis community will have the opportunity to meet and hear from the new coach on Thursday night at a Meet and Greet scheduled at the school's auditorium beginning at 7pm.